The Nashville Predators finished off an extended road-trip against the Edmonton Oilers on Monday evening. For the Predators, they were able to get a hefty contribution from James Neal who netted his sixth career hat-trick with goals in the first (8:04), second (00:51), and third (4:18) periods. The Oilers were able to get scores from Jordan Eberle (21) and Iiro Pakarinen (5) but Nashville prevailed by a score of 3-2. Pekka Rinne had a strong showing stopping 28 out of 30 shots and recorded his 28th win of the season, placing him 10th in the NHL in wins. The Nashville Predators are in the final twelve games of the regular season, eight of which will be at home. After extended road-trips over the last month, it will be good to see the Predators in front of their hometown fans, not staying up until 9:00 pm for west coast starts, and producing wins in front of a friendly audience. Nashville has a 17-10-6 record at Bridgestone Arena this season, but has recently played better outside of the state of Tennessee. The Islanders are a tough opponent but play much better at home than on the road. The Preds need to take advantage of having a majority of their schedule at home down the stretch. The first line of the New York Islanders are, by far, their best line. Their first line typically consists of Mikhail Grabovski, John Tavares at center, and Kyle Okposo. Both Okposo and Tavares share the team lead in points with 55. Tavares leads the team with 26 goals. Okposo leads the Islanders with 36 assists. Grabovski is no slouch with 25 points on the season. The team will have to defend this front line closely. If you give Tavares in time-in-space, he will make you pay. Okposo likes to set up Tavares on many of his scoring opportunities (four points in five games). The Predators have played extremely well over the last five games on the penalty kill. The PK unit has put together a stretch of not allowing a single goal over this time when the opposing team has an extra attacker. At 80.2%, the Predators are ranked 21st in the league on the penalty kill, which is a far cry from earlier in the season. Going into the playoffs, the PK unit will become vital to the success or failure of this team. 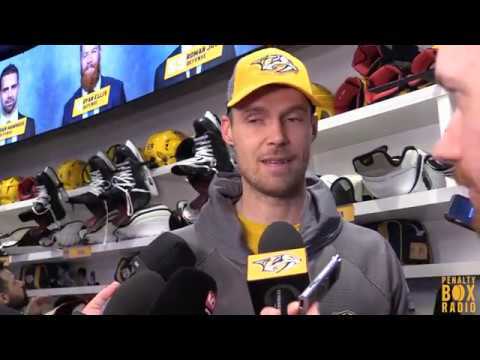 The Nashville Predators will be welcomed back, with open arms, to Bridgestone Arena tonight. After a lengthy road-trip, the Preds will get back to work on home ice. Be sure to catch all of the action on Fox Sports-Tennessee or you can listen live on 102.5 The Game. Puck drops at 7:00 pm!